The threat from ransomware is so frightening and immediate, given the extensive coverage of last week's attack, that it is easy to forget about another technological threat -- identity theft. Identity theft occurs when a criminal hacks into your computer to steal personal data, or simply finds something useful in your mailbox, and uses it to create credit accounts in your name. While ransomware may put your photographs, correspondence, and everything on your computer hard drive at risk, identity theft can bury you with debts that aren't yours, ruining your credit and taking years to straighten out. A new survey by Experian, one of the three credit bureaus, has found wide gaps in consumers' awareness of the identity theft threat, and perhaps because of that, it finds gaps in consumers' protective measures. Most consumers in the survey -- 84% -- admitted they are concerned about the security of their personal information online. But the complexity of the issue, the inconvenience in doing something about it, and the belief the odds are against them becoming a victim, discourage them from taking action. For example, nearly half the consumers in the survey admitted they don't check their credit reports once a year, even though the law allows them to do so at no charge. "Consumers seem to be tuning out rather than tuning in," said Michael Bruemmer, vice president of identity protection at Experian. Experian conducted the survey to coincide with the launch of its new identity theft protection service, IdentityWorks. While these services may prove useful, there are other steps you can take to protect your identity, and they cost nothing. First, shred or otherwise destroy all discarded documents that have your sensitive information in them -- things like Social Security numbers, birthdays, mother's maiden name, or anything else that could be a unique identifier. Never transmit this information in an email. Be vigilant for email phishing scams, designed to trick you into revealing this information, in the belief you are dealing with a legitimate organization. Legitimate organizations do not ask for this information online. If you have been a victim of identity theft, of a "soft" incident, where your credit card information was among the data stolen in a hack of some retailer's network, you can ask all three credit bureaus to freeze your credit report. That means no one can access it without your permission. Without access to your credit report, no credit accounts can be opened in your name. The freeze is good for 90 days, and can be renewed. Earlier this year Javelin Strategy & Research reported there were 15.4 million identity theft victims in the U.S. in 2016, a record high. It's up 16% since 2003, with losses rising to $16 billion. 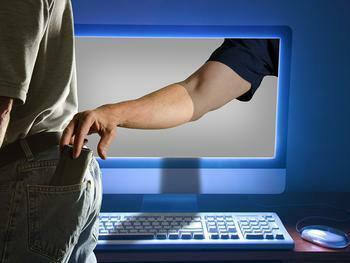 The biggest increase was in the use of stolen credit card data, especially for online transactions.